We had a small but intimate crowd this week. But we had a great time and everyone really got to be “hands on!” We enjoyed two savory treats – the Chili Salt squid and the mini pizzas (with a twist) while we prepared breads, salad and soup. When we sat down to feast on soup, bread and salad the aroma of the gingered pears filled the kitchen. We couldn’t wait for dessert, even though we were all pretty sated by the time we were done with the meal. Cut the squid down one side so it opens up. Use a sharp knife to trim and discard any internal membranes. Cut it lengthwise into 1-inch wide strips, then cut each strip in half. Combine the cornstarch, flour, chili powder, pepper and salt in a large bowl. Heat a large saucepan with vegetable oil and heat over high heat until the surface of the oil shimmers. 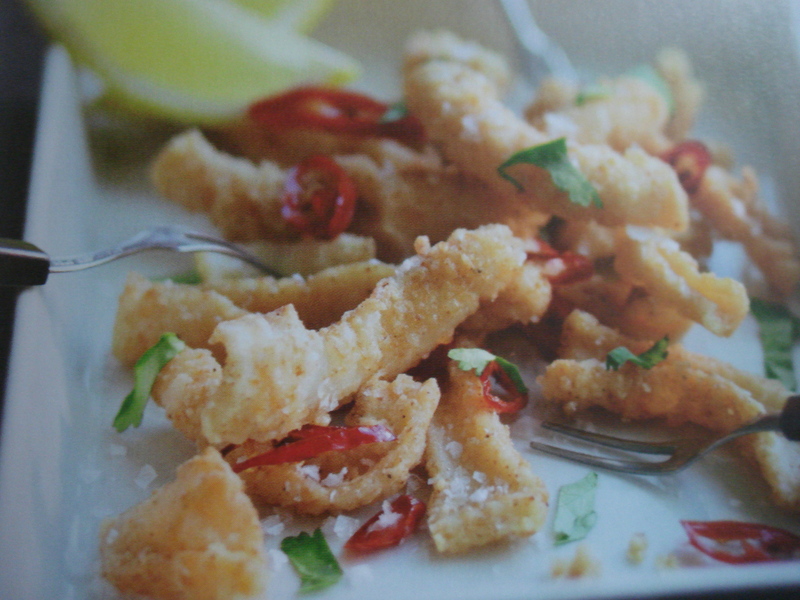 Toss half the squid in the flour mixture quickly shaking of the excess. Add them to the oil and cook for about 2 minutes until deep golden. Remove with a slotted spoon and drain on paper towels. Repeat until the squid is cooked. Put the chili strips in to the oil and cook for just a few seconds. Drain. Put the squid on a serving plate and sprinkle with the cilantro. Serve while warm with plenty of lime or lemon to squeeze over the top. Cook the potatoes covered in water, with the salt until just fork tender. Remove, cool and slice into ¼ inch thick slices. Put the thyme, onion, bacon and cheeses into individual small bowls and set aside. Unwrap and unroll the thawed phyllo dough, placing the stack on a work surface. Put a six inch plate on top of the dough and with a small sharp paring knife cut the dough all the way around in a circle, until all the dough is cut into circles. Discard the scrap dough and place all circles in a pile. Lay a dampened clean tea towel over the dough to keep it moist. Line two baking sheets with parchment paper or nonstick baking mats. Place three phyllo circles on each prepared sheet. Lightly brush the circles of dough with butter. Place another circle of dough atop each one and brush again with butter until all the circles have been place atop each other, each layer lightly brushed with butter. Put 3-4 slice of potato on each stack. 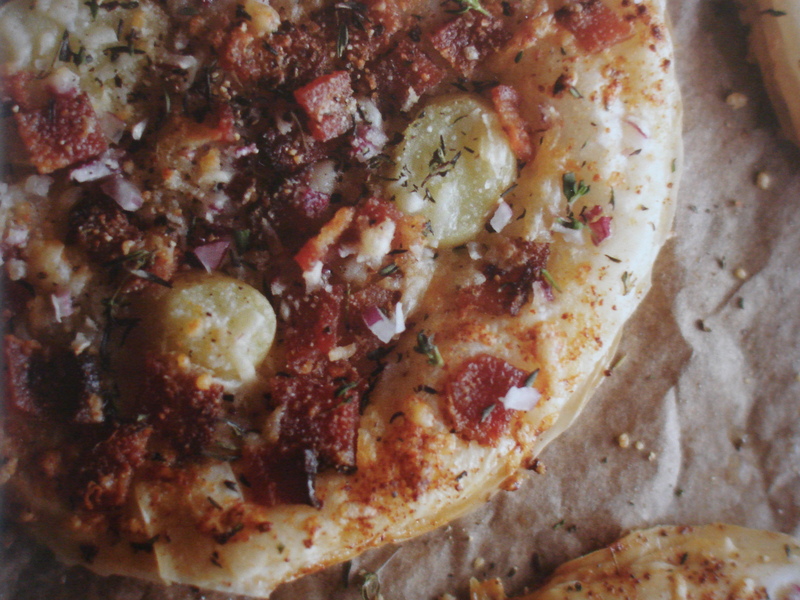 Sprinkle the thyme, salt, pepper, onions, bacon and cheeses on top of each pizza. Bake until golden brown, making sure the centers and bottom are also brown about 12-15 minutes. Transfer to a cutting board and cut each one into 4 wedges with a sharp chef knife or pizza wheel. You may garnish each slice with crème fraiche if desired. Lightly oil an 8 x 3 inch loaf pan and dust with flour. Put the raisins in a small bowl and cover with hot water to plump. Set aside for 10 minutes. Sift the flours, brown sugar, baking powder and soda, and spices together in a large bowl. Put the drained raisins, cheddar cheese, eggs, oil, hazelnuts, pumpkin puree and milk in a bowl and whisk together until blended. Pour the pumpkin mixture over the flour mixture and gently blend together until well mixed. Spoon the batter in to the prepared pan and spread evenly. Bake about 45 -55 minutes until the top springs back when lightly pressed. Cool in pan on cooling rack for about 10 minutes before inverting loaf to remove from pan. Serve the bread warm or wrap tightly in plastic film to store at room temperature for up to 1 week. Butter or spray an 8 x 3 inch loaf pan. Put the garlic and butter into a small saucepan and warm over low heat just until the butter melts. Stir the flour, baking powder, salt, sugar, pepper and tarragon into a medium size bowl and mix well. Crack the egg into a small bowl and stir in the sour cream and buttermilk. Pour the egg mixture and garlic butter over the flour and blend just until mixed. Don’t worry about a few dry spots in the dough. Spoon the mixture into the prepared pan and place in the oven. Bake until the top springs back when gently touched about 45 to 55 minutes. Place the pan on a cooling rack until just warm. Unmold the bread. Can be keep for up to a week if wrapped tightly in plastic wrap. 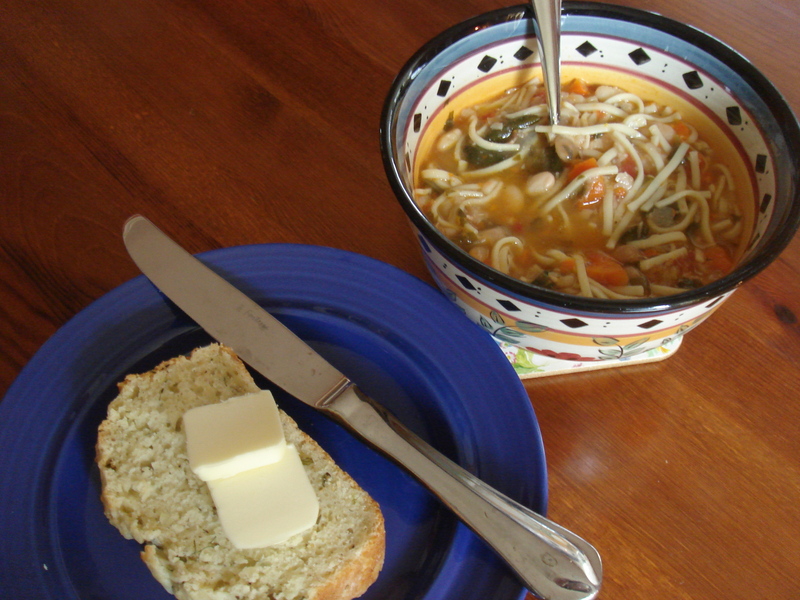 Serve as a side to soup or cut a thick slice and toast. Top with butter, a warm slice of roasted chicken breast meat, arugula, a thin slice of apple and a slice of brie. Drizzle with a bit of lemon olive oil and enjoy a tasty lunch! Drain the beans. In a large soup pot over medium heat, sauté the onions, until softened. Add the carrots and sauté for 3 minutes. Add half of the Swiss chard and sauté until wilted. Add the stock, beans, tomatoes, basil, and garlic and simmer partially covered about 1 hour. In the meanwhile, cook the pasta al dente – 3 to 5 minutes and drain. In a food processor, blend the soup in batches, leaving some texture. Alternatively, hand mash the soup in the pot until the desired consistency is reached. Return the soup to the pot and warm over medium high heat. Add the cooked pasta and the remaining chard. Cook until chard is wilted – about 3 minutes. Season with salt and pepper and add 2 Tablespoons of the parsley. Ladle the soup into bowls and top with fresh grated parmesan and a sprinkle more of parsley. 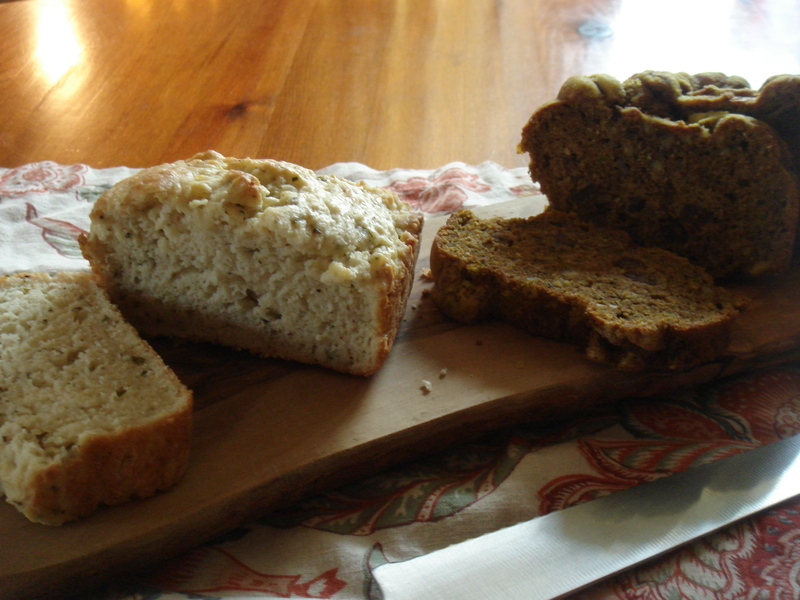 Serve with a crusty loaf or homemade bread. Heat the oven to 350 degrees. Toast the walnuts on a baking sheet for 8-10 minutes stirring occasionally. Chop coarsely. Do not make them too small to eat with a fork. Place the toasted walnuts in a bowl and macerate them in 3 Tablespoons of the dressing while you prepare the salad. Wash and tear the romaine into bit sized pieces. Place in a large salad bowl. Wash and slice the persimmon into thin wedges or slices. Drizzle a bit of dressing over these on a plate or in a small bowl. Break the gorgonzola cheese into bite-sized morsels and add to the salad greens. Add the walnuts and enough vinaigrette to coat the walnuts. Toss the greens with dressing, walnuts and cheese and divide among 6 salad plates. Decorate the plated salad with the persimmon slices and serve. Heat the oven to 375 degrees. Lightly butter a large shallow baking dish. Peel the pears, cut in half and remove the cores. Arrange pear cut-side down in a single layer in the baking dish. Combine the cream, sugar, extract, cinnamon and ginger and pour it over the pears. 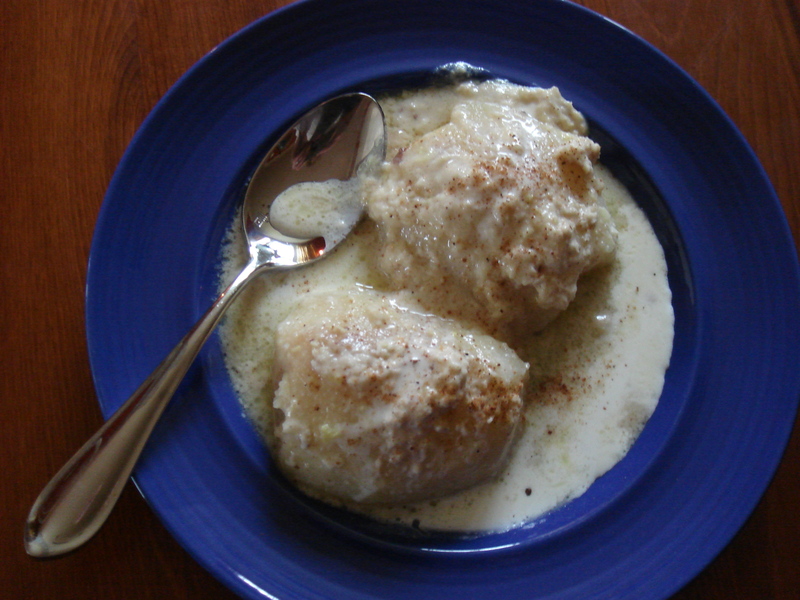 Bake for 30-35 minutes, basting occasionally, until the pears are tender and browned on top and the cream is thick and bubbly. Cool slightly before serving.